If Facebook goes public, what will it be worth? Back in August, Fortune made the case that the giant social network could be worth $50 billion. Among the reasons: Facebook was cash-flow positive, had more than 500 million subscribers, was pushing into new businesses and was on track to generate more user visits than Google (GOOG). Another report from Bloomberg said Facebook was worth about $25 billion late last year, based on how investors were valuing its shares on two private exchanges for venture-backed companies, though prices aren't made public. 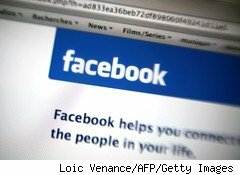 Now, there's a new report out from financial research firm Trefis that pegs Facebook's value at $45 billion today. But Trefis says if the company can double its ad revenue per page, increase its page views by 50%, gain a 10% share of the search market and double its per-user revenue generated by games, its value could soar to $125 billion.